Dundee United and Celtic will fight it out for the first major trophy in Scottish football on Sunday – The Scottish League Cup. For new Celtic boss Ronny Deila it’s the first step towards the treble he declared as the target in his first season since taking over from Neil Lennon. Standing in his way will be Jackie MacNamara and his Dundee side, who will be desperate to make up for their defeat in last season’s Scottish Cup to St. Johnstone. Both sides have enjoyed some memorable wins on their way to this season’s final, and for Dundee United it was a 1-0 win over City rivals, Dundee, in the third round that got them on the way. They beat Hibs 7-6 on penalties after a 3-3 draw in the quarter-final to set up a semi-final against Aberdeen. Nadir Ciftci proved to be the hero as he scored a late winner as the Tangerines came from one down to beat the Dons. Celtic made light work of Hearts in the third round, winning 3-0, before John Guidetti notched a hat-trick in the 6-0 thrashing of Partick Thistle in the quarters. That set up a sensational Old Firm derby in the semi-final, and despite Guidetti’s claim he would score another hat-trick against Rangers, he failed to find the net in a fairly routine 2-0 win. 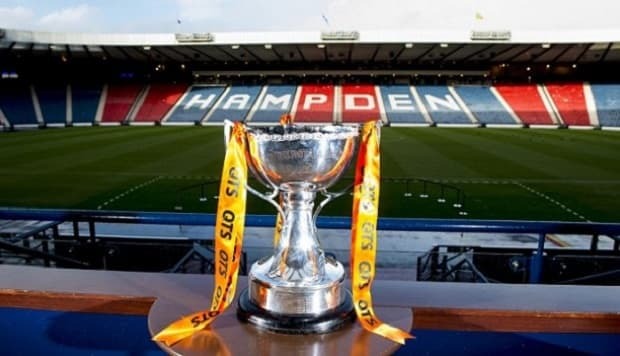 This will be Dundee United’s first appearance in a Scottish League Cup final since 2008, when they were beaten on penalties by Rangers after a 2-2 draw. They did, however, reach the final of the Scottish Cup last season, where they were beaten by a goal in each half by St. Johnstone. The Tangerines have won the League Cup twice in their history, beating Aberdeen in 1979/80 and Dundee in 1980/81. Celtic are bidding for their 15th League Cup trophy, but they haven’t won it since beating Rangers in 2009, and have lost two finals since – in 2011 to Rangers, and in 2012 to Kilmarnock. We don’t have to go too far back to find some recent form between these two sides, and this will actually be one of four encounters in the next two weeks. They met last Sunday in a fiery 1-1 draw in the Scottish Cup quarter-final at Tannadice, a match in which three players were sent off. They have the replay to follow this game, followed by a Premier League clash on March 21st. That Scottish Cup quarter final certainly stoked the fires ahead of this game, and it was full of controversy. Dundee United’s Paul Paton and Celtic’s Virgil van Dijk were given their marching orders for an early clash, but both have appealed the decision and been cleared to play in the final. Paton on the grounds that it was a case of mistaken identity, as it was actually Calum Butcher who was the offending party. A loophole in the SFA’s rules means that no retrospective action can be taken against Butcher, and much to Celtic’s dismay, he will also be allowed to play in the final. Turkish striker Nadir Ciftci has also appealed a two-game ban handed down to him by the SFA for allegedly kicking Celtic player Scott Brown in the head, but misses the final anyway due to a previous ban. The game itself was heading United’s way after Ciftci had scored a first half penalty, but Celtic clawed their way back into the game with a Leigh Griffiths header – atoning for his earlier penalty miss and setting up a replay at Celtic Park. Although Celtic bossed possesion, Dundee United more than held their own, and were good value for the draw. They look a shade overpriced for the final and are capable of taking Celtic all the way to extra time. Of the last seven League Cup finals, only one has been won by more than a single goal, and two have been drawn after 90 minutes. It’s typical for finals to be tight, tense affairs, and the bad blood between these two teams will ensure that no-one gives an inch. The draw after 90 minutes appeals to us at a stand out 4/1 5.00 +400 4.00 4.00 -0.25 and we also fancy a long shot on Celtic to win on penalties. The way Dundee United scrapped on Sunday suggests that they will be more than prepared to do so again, but with star striker Ciftci missing it will be a big loss to the team. Without him it’s hard to predict an upset, particularly over 90 minutes, so the draw looks a good bet. If it gets that far it’s bound to be heart-in-the-mouth time for Tangerines fans as by that stage you would expect Celtic to be piling on the pressure in search of a winner. It might be backs to the wall stuff, but in some ways, the absence of Ciftci could help the other players focus on the job in hand of frustrating Celtic. That’s why we like the look of Celtic to win on penalties and will have a small investment at a very tasty price. They have the nous and the know-how in those situations, and it would be a monumental effort for the Dundee United players to hold out for 120 minutes. We think Dundee United can force extra time but if it gets as far as penalties we’d fancy Celtic’s experience and class to shine through and the Hoops can lift the trophy.